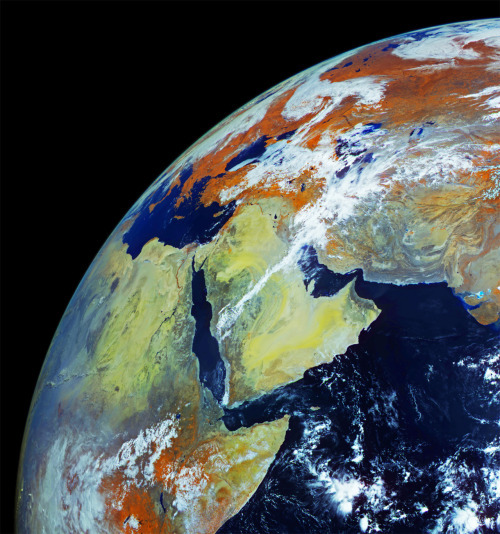 Horn of Africa from Space (via Planet Earth.ca). The Intergovernmental Authority on Development (IGAD), an eight-country trade bloc in Africa including governments from the Horn of Africa, the Nile Valley and the African Great Lakes region and with headquarters in Djibouti City, signed a memorandum of understanding last Friday (27 Mar 2015) with the International livestock Research Institute (ILRI). The signing, which took place at an IGAD General Assembly meeting in Addis Ababa, Ethiopia, establishes and defines a framework for cooperation and strengthens the IGAD-ILRI research and development work in the IGAD member states: Djibouti, Eritrea, Ethiopia, Kenya, Somalia, South Sudan, Sudan and Uganda. Under the auspices of a Technical Consortium for Building Resilience in the Horn of Africa, ILRI has been working with IGAD since 2012. ILRI’s primary role in the consortium till now has been to provide technical assistance to the member states in the form of development of investment strategies aimed at ending drought emergencies and ways to measure enhanced resilience. ILRI and the IGAD Secretariat are already implementing the MOU and developing a joint work plan involving, but not limited to, the following areas of work in support of the IGAD Drought Disaster and Sustainability Initiative (IDDRSI) and the eight member states within the IGAD region. For more about the Technical Consortium, established in 2011 as a project of the CGIAR and housed at ILRI, see this poster and brochure and check out their website. Tags: Djibouti, IGAD. Bookmark the permalink.